During the manufacture of a metal-oxide semiconductor (MOS) capacitor, different cleaning processes were used by two manufacturing systems that were operating in parallel. Process A used a standard cleaning solution, while Process B used a different cleaning mixture that contained less particulate matter. For five consecutive days the causes of failure with each process were observed, recorded, and saved in the SAS data set called FAILURE. In a radar chart, the vertices are determined by the levels of a single variable, which is specified in the CHART statement. In this example, the variable CAUSE is specified as the chart variable. The spokes in the chart start at the twelve o'clock position and go in a clockwise order. 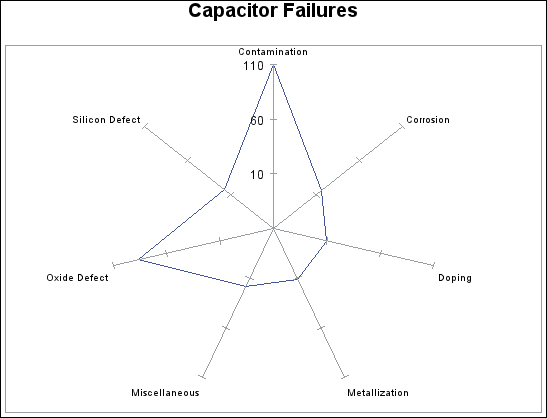 The output shows that Contamination and Oxide Defects are the most frequently occurring problems. The FREQ= option specifies variable COUNT to score vertex lengths. Thus, the values of COUNT weigh the contribution of each observation in the computation of the chart statistic.